Animal Farm - A book central to the liberal understanding of best democratic practice and those things that stand in opposition to it. A book central to the liberal understanding of best democratic practice and those things that stand in opposition to it. First published in August 1945, Animal Farm is George Orwell’s best known work and is rightly identified as a literary classic. It sits alongside Fahrenheit 451 (Ray Bradbury), Brave New World (Aldous Huxley), Darkness at Noon (Arthur Koestler), The Trial (Franz Kafka) and Orwell’s own 1984 as one of the great commentaries on totalitarianism and its consequences. 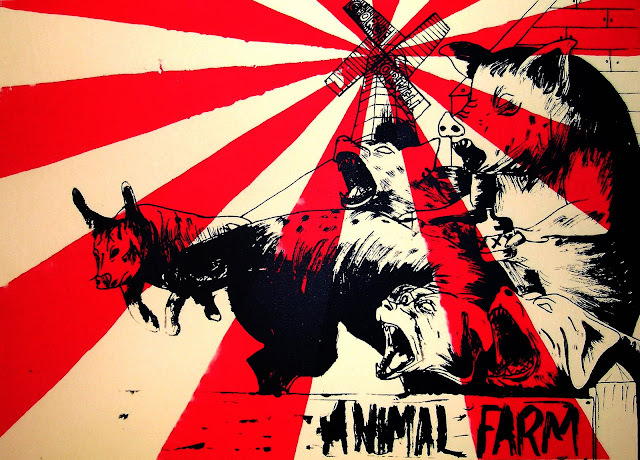 It tells of how the animals of Manor Farm overthrew its cruel, drunken and incompetent farmer, changed its name to Animal Farm and reestablished it as a model community; of how they constructed a moral code, informed by the principles of ‘Animalism’, which prescribed that all animals were equal and identified man as the enemy; of how the pigs – the brightest of the animals – naturally assumed the leadership and Napoleon and Snowball – two of the cleverest – fought each other for control of the revolution; of how Napoleon ousted Snowball, chasing him from the farm, banishing him as a traitor before setting about tarnishing his name and establishing his mastery over the other animals; of how the surrounding farmers reacted, attacking the farm, only for the animals to repel and beat them off; of how economic necessity forced the animals to compromise and to engage with the human world they had rejected; how Napoleon steadily took that compromise to its uneasy conclusion, exploiting the animals and manipulating the humans all the while securing his own personal dictatorship; of the way, with time, the animals came to realise that their dream had been subverted and their principles warped into an aberration, to the extent that their final state of affairs was as bad – if not worse – than their first; how the farm learned that some animals are more equal than others and of how the ruling pigs slowly but steadily became indistinguishable from the humans they had initially set themselves against. In this way the book – essentially a extended metaphor – mirrors events in the Soviet Union under Stalin, in the era preceding World War II; and it serves as perhaps the quintessential metaphor for democratic meltdown and the way in which totalitarianism subtly gains a foothold before establishing itself as a regime. It is worth distinguishing between popular fiction and considered intellectual appraisal because, while popularity does not necessarily lend itself to the complex analysis reality generally necessitates, when used properly in this way it does add another important weapon to its arsenal; that is, an appeal that lifts political commentary from that often inaccessible realm in which much considered academic work is trapped by its own complication and delivers it into the hands of those who seek a far simpler read. And Animal Farm is a metaphorical pool as deep as one is willing to dive. That such a simple narrative has managed to capture such a profound set of ideas in such a powerful way says much about Orwell’s ability to make a political insight resonate both emotionally and intellectually. It is one of those rare books that can be read and appreciated by both those with an intimate knowledge of that facts to which it alludes and those without; for the book – although arguably more powerful when held up against human history – generates a potent effect regardless and a defining attitude in response to its message. As such, it has had a worldwide appeal to human sentiment rarely matched and, rarer still, surpassed. I first read Animal Farm when it was prescribed by my school to me as a young teenager. The historical context to which it refers was explained to me but it only settled on my mind in a temporary way; certainly, its significance would only be meaningfully impressed upon me later in life. Nevertheless, the moral reasoning implicit in Animal Farm made an immediate and imposing impact and remains with me to this day. No doubt many who read the book in their youth can speak of a similar experience. This character alone makes the book exceptional. In an article called Why I Write, written a few years after Animal Farm, Orwell provides the rational behind his work: “Every line of serious work that I have written since 1936 has been written, directly or indirectly, against totalitarianism. Animal Farm was the first book in which I tried, with full consciousness of what I was doing, to fuse political purpose and artistic purpose into one whole.” Animal Farm, then, can be read as a warning, as too can 1984, but it is within this warning that many of Orwell’s greatest insights lurk; for, as he suggests, the book is not detached from human experience, indeed, it is grounded in it. Totalitarianism in and of itself is merely an ideological curiosity. It is given life by human behavior, which often seeks out the path of least democratic resistance, despite our best efforts to shore it up with good intentions, even to build a wall around it. By using an allegory, with animals as the main protagonists, Orwell created the perfect vessel to deliver his message: a set of characters slightly removed from us by appearance but to which we can relate in every other way. They may be stereotypes, incapable of emotional growth or change, but each one, good or bad, represents a particular human trait. 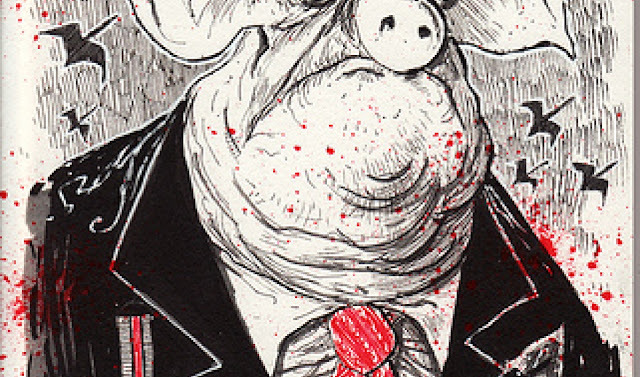 And it is in forcing us to identify with those traits that Animal Farm strips away the rhetoric in which political action is so often couched and explained away and lays bare for us to see the deliberate and focused attempt to subvert justice and the rule of law. Throughout his life, Orwell concerned himself with those people who failed to protest against the world they lived in. His criticism of contemporary American novelist Henry Miller – contained in his famous essay Inside the Whale – was driven by this very consideration. Miller, like Orwell, had written about the downtrodden and destitute but not, Orwell argued, to enact change, rather as an end in and of itself. He wrote that Miller “had performed the essential Jonah act of allowing himself to be swallowed”, remaining passive and accepting. And so it is with Animal Farm, set against the backdrop of Joseph Stalin’s Soviet Union and a world enamored with its particular version of socialism it was a warning that, beneath its veneer, human nature was hard at work, tearing down good intentions and establishing a personal dictatorship that, ultimately, would be responsible for the deaths of millions of innocent people. Only by recognizing those threats, could we act to counter them. In this sense Animal Farm is not a commentary, but a call to action. In the letter, Eliot argued that Orwell’s “view, which I take to be Trotskyite, is not convincing.” He took particular umbrage with Orwell’s characterization of the pigs on Animal Farm. Napoleon, a Berkshire boar thought to be based on Stalin, triumphs, despite being the novel’s baddie. He battles with Snowball, a much nicer pig modeled on Leon Trotsky, who genuinely works for the good of the other animals. 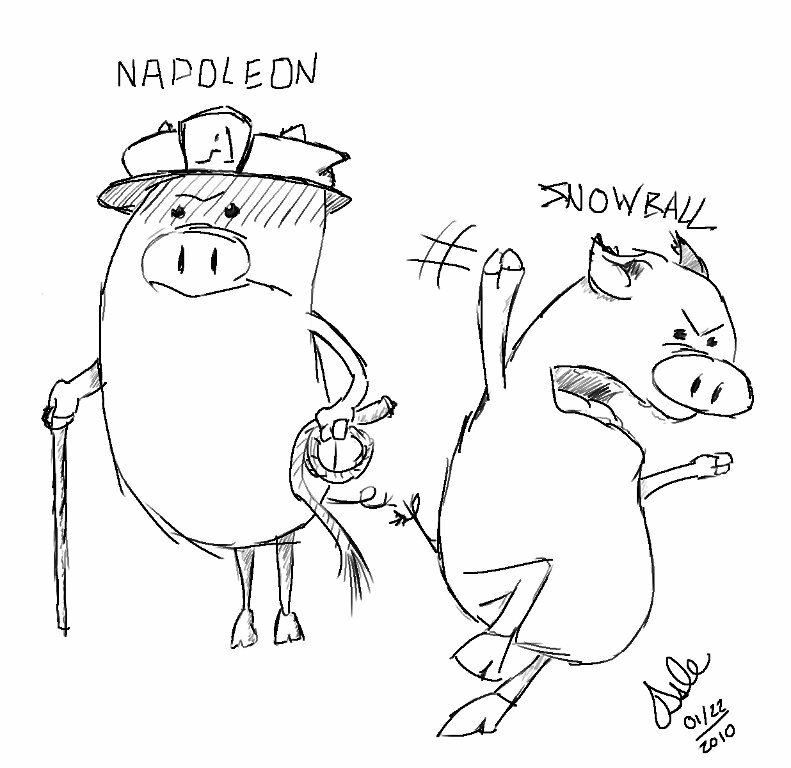 It is Napoleon’s bully boy tactics which seem to win the day, while Snowball is chased off the farm by dogs. This mirrored Trotsky’s deportation from the Soviet Union after he criticized Stalin. Eliot seems to imply that if Orwell’s intention is to convince the reader of the logic of Trotksyism over Stalinism, the more sensible authorial decision would be to have “more public spirited pigs” – such as Snowball, presumably, rather than more Stalinesque communism in the shape of Napoleon. “I think you split your vote, without getting any compensating strong adhesion from either party – i.e. those who criticize Russian tendencies from the point of view of a purer communism, and those who, from a very different point of view, are alarmed about the fate of small nations,” wrote Eliot. One can only imagine how that sentiment must have irked Orwell, not only the distorted reading of the book’s underlying purpose but the nitpicking about particular interpretation. And rightly so, for no metaphor holds up to close examination and to apply this test to Animal Farm is to miss the point of the book. One would do well to remember that it was published in 1945; for a further ten years thereafter Stalin would rule with terror and death; only to be followed in China by Mao, a brutal dictator so shrouded in favorable mystique that only today are we beginning to know full well the extent of the atrocities committed under him. Orwell could see the bigger picture – those more general patterns of political behavior which mark democratic decline – Eliot could not. Nor was he alone in this regard. Had Animal Farm been written in, say, the early 1900's, its influence might well have better informed the world’s attitude to what happened in the Soviet Union. And that is its great value, for all those concerned with best democratic practice it is a warning, that good intentions are not enough on their own and the price of democracy is eternal vigilance. While Orwell might have concerned himself primarily with totalitarianism, he had much to say about nationalism too. His essay Notes on Nationalism remains one of the great works on this particular political ideology and, as with Animal Farm, Orwell’s special skill was to recognize the emotional drivers that underpin nationalist thinking and to translate them into succinct political insight. Totalitarianism differs from other ideologies in that it is a consequence more often than a purpose. In modern history few have set about with the express intent of establishing a totalitarian state; rather one emerges as a consequence of the steady erosion of democracy, to the point where one person, party or faction controls the state in its entirety with the purpose of overseeing every aspect of public and private life. In this sense, any political ideology which does not show the proper respect for the basic tenets of democracy – the rule of law, a separation of powers – serves as fertile ground from which an authoritarian regime might grow. Nationalism is such an ideology and Orwell was acutely aware of this fact. The African National Congress is a nationalist organisation and much of what is wrong in its approach to South Africa’s constitutional state – the warning signs which mark a threat to democracy – are reflected in Animal Farm: The steady erosion and warping of the basic principles that define the constitution (over time, the pigs literally rewrite the seven commandments initially agreed upon, eventually reducing them down to the simple maxim: ‘All animals are equal, but some are more equal than others’); The consolidation of power in the hands of an elite few; The use of rhetoric and propaganda – illogical and contradictory in its own right – to explain away undemocratic practice and distort history; even the celebration of pomp and ceremony as the elite basks in its own glory; all of them resonate with our current political condition. Even the narrative in its broadest sense, the undermining of a dream made real, rings true. But Orwell does not reserve is pen for damning only those responsible for this perversion, he offers too a number of powerful insights into the attitude of the victims. Benjamin, the sardonic donkey, perhaps deserves particular mention. Unlike the other animals Benjamin is clever, able to read as well as the pigs, and yet he is a victim; never raising his voice; never celebrating triumph or bemoaning despair, only to say when asked, “Donkeys live a long time. None of you has ever seen a dead donkey.” In South Africa there are many people one could attach such a label to; that silent majority that quietly damns any state of affairs by their inaction, only to see their own conditions deteriorate; the pessimists who constantly redefine their own vicious circle. 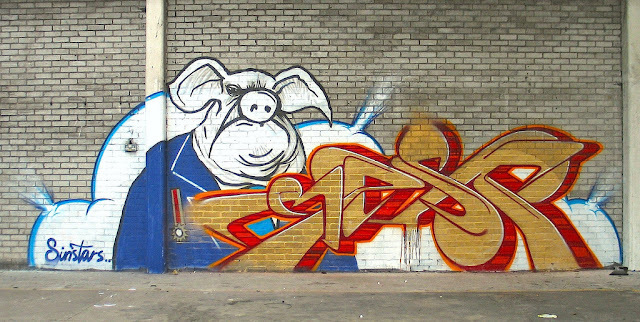 Likewise, the sheep, whom the pigs train to bleat meaninglessly at any given interval ‘Four legs good, two legs bad’, without any consideration for the merits of the situation or the ever-increasing weakness of their particular belief, despite their fate being intricately linked to the fate of those they address. Their vacuous nature is finally revealed in the closing chapter, where they are taken aside by the pigs and re-educated, emerging to bleat mindlessly ‘Four legs good, two legs better’ as the pigs suddenly start walking upright. There are many political analysts today, who produce much of the commentary we read and hear, who are unable to separate reality from ideology and bleat repeatedly, ‘Apartheid bad, ANC good’, without due consideration for their own circumstance or, indeed, the veracity of their claim. But perhaps the most powerful parallel lies not with a particular character or even the nature of the narrative; but with its purpose. It was only with the death of Stalin and Mao that the full horror of the particular piece of history which Animal Farm seeks to illuminate became known in no uncertain terms. South Africa is not on the verge of becoming a totalitarian state in the sense the Soviet Union was but, under the ANC, the dream has been eroded away and there are significant warning signs that all is not well. The challenge then is to use what we know to effect change. So, when this period of our history is written up sometime in the future, we have a duty, Orwell would argue, to make sure we have done what we can to ensure it is the best possible history and that involves first, understanding what is happening, second, acting to counter it and third, convincing others of that purpose. This quote represents, in many respects, a turning point in the farm’s fortunes. It occurs relatively early in the book and concerns the first meaningful act of personal indulgence and bias on the part of the pigs; perhaps significantly, before Snowball has been chased out of the farm by Napoleon’s dogs. Squealer, identified from the start as the most gifted propagandist among the pigs, with the possible exception of Snowball, has been dispatched to explain away to the animals the executive decision – the first of its kind – to remove the apples and milk from the general diet and reserve it solely for the pigs. It is regarded by the animals, at the time, as a fairly innocuous decision, and Squealer’s explanation accepted as perfectly rational. Nevertheless, it was undertaken undemocratic ally and the explanation, on proper examination, illogical (if anything their could be an equally plausible case to be made that the animals, not educated to the degree the pigs were, were the ones in special need of the apples and milk and not the pigs). But the rule was bent and a precedent set, not just in terms of the warping of values but the pattern of behavior that would define all such decisions in the future: an arbitrary rule, violently enforced and subsequently explained away. This sort of thing happens all the time in South Africa and we are at the forefront of that battle; each tiny encroachment must be recognized for what it is and countered, because one thing leads to another and any undemocratic precedent, no matter how small in practical terms, has far bigger implications for the principles and values that underpin it. In conclusion, you will note that, as a final persuasion, Squealer asks the question ‘surely there is no one among you who wants to see Jones come back?’ (Jones being the cruel and incompetent farmer the animals chased away at the start). There is a strong case to be made that Jones is to the pigs as apartheid is to the ANC – an irrational fear promoted and propagated amongst the citizenry to justify undemocratic behavior. That trait is common to nationalist thinking which, because it defines itself against something – the other, the past – constantly requires the nationalist to juxtapose the present with another time and place, simultaneously invoking the fear implicit with it. Certainly Orwell had their number and to see it captured so cleverly, reduced to its simplest form, gives those concerned with these kinds of things a sense of satisfaction, that they are not alone in their interpretation. Animal Farm is an animal satire through which Orwell indirectly attacks on the Russian Communism, on Stalinism. Through a humorous and effective animal allegory, Orwell directs his satiric attack on the events of the Russian Revolution and on the totalitarian regime. Orwell combines political purpose with artistic purpose to voice his pessimistic belief, which stems from various experiences he had of the revolution in Spain and the results of the Russian Revolution, that people can only change the tyrants through revolutions but the systems remain the same. He believes that it is only a dream, an ideal to assume that people can achieve a classless society through revolutions. Moreover, he thinks this ideal that begins as utopia is doomed to failure since human nature is corrupt. It is very likely that the lust for power felt by those who are cleverer and more skilful than the others turn revolutionary enthusiasm into the opposite. In a society where people have no voice, if the ruling body with privileges such as special education, luxury and titles, has absolute power, this will lead to total corruption and disintegration of values. Thus, in the novel, the dream, the ideal shatters since what happens in the end turns out to be in sharp contrast with what the Revolution was all about. The dream was a classless society where everybody would be equal and free, enjoying a perfect democracy; the reality is the terror and poverty of dictatorship in which some individuals are "more equal" (Orwell, 1955, p.114) than the others (Hollis, 1962, p. 225). However, although the structure of the novel is suggestive of the Marxist Revolution due to apparent parallels on the level of plot, it could resemble any class of idealistic principles which is mainly based on propaganda but which is not a workable system. Christopher Hollis puts it this way: "The lesson of Animal Farm is clearly not merely the corrupting effect of power when exercised by Communists, but the corrupting effect of power when exercised by anybody." 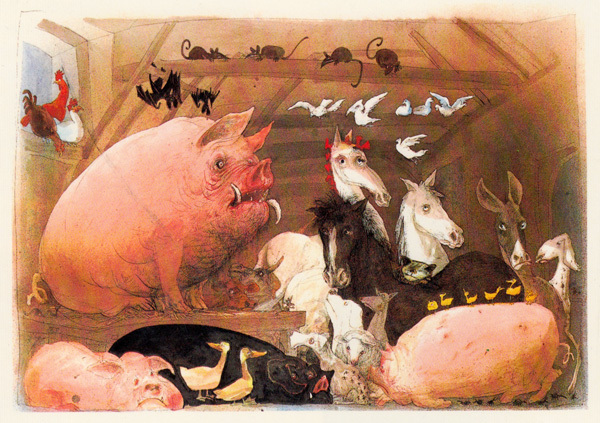 The first chapter of the book introduces old Major, the prize Middle White boar, telling the animals about his dream. He says he dreams of a new life for the animals and encourages them to take action against the cruel owner of the Manor Farm, Mr Jones. Shortly afterwards old Major dies and the animals rebel. 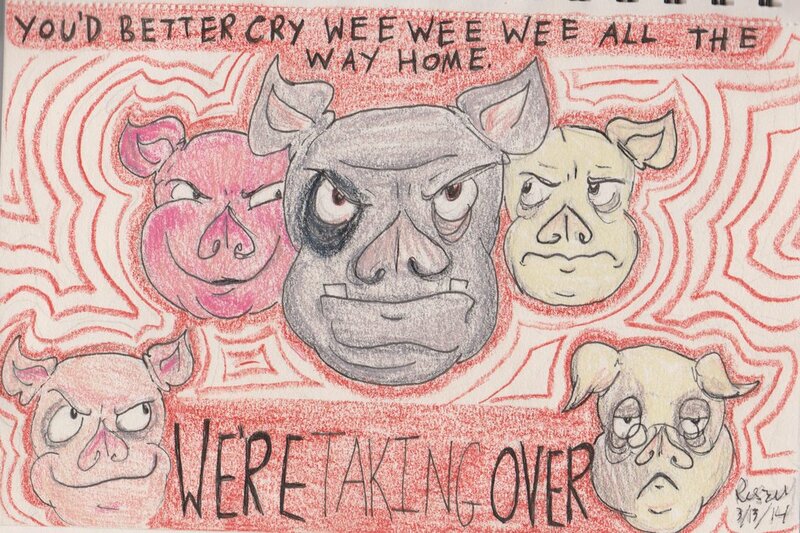 They expel Jones and rename the farm as Animal Farm. All the animals participate in the rebellion. The pigs, who consider themselves the cleverest of all, assume the administration of the farm. They write the principles of their new system called "Animalism" on the wall. The principles are reduced to Seven Commandments for the animals to keep in mind easily. According to these principles no animal will be in association with or will get in touch with human beings. 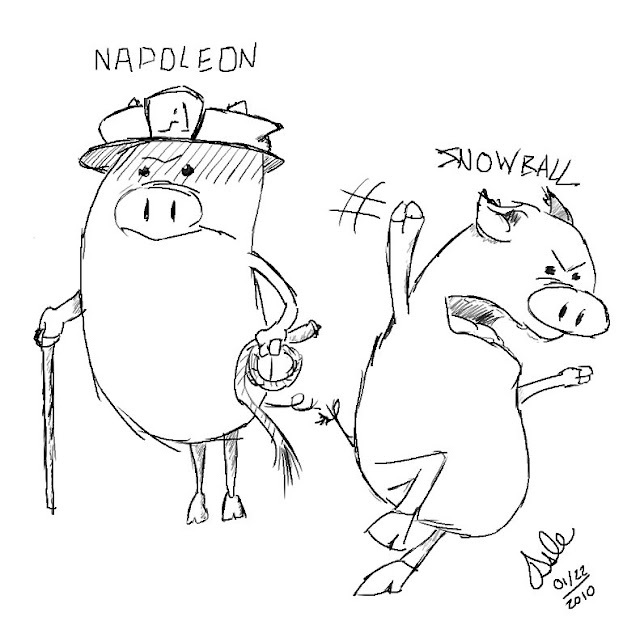 Napoleon and Snowball, the two boars, compete for the leadership but when Jones and the other farmers assault on the animals, they unite. After this war, while Snowball is busy with improving life in the farm by building a windmill, Napoleon prefers to educate the young. Although Napoleon seems to oppose the idea of the windmill, soon afterwards he drives Snowball out of the farm by force and takes over the project as his own. After Snowball has left, life gets worse in the farm. The pigs and the dogs are cruel and at the same time unproductive. They are ready to consume whatever is produced and to justify their actions. The importance of keeping the pigs in good health was all too obvious. So it was agreed without further argument that the milk and the windfall apples (and also the main crop of apples when they ripened) should be reserved for the pigs alone. Then they begin to use Snowball as a scape-goat who, they claim, comes and goes secretly to give the animals harm. Later on, he is accused of having destroyed the windmill. The pigs use him as a tool to frighten the animals since "there was one thing that the animals were completely certain of, it was that they did not want Jones back". In time, the pigs start to transact business with human beings. As they adopt human behavior and comfort gradually, the nature of the Seven Commandments are changed in such a way as to justify what the pigs do. Although some of the animals happen to remember the true nature of the Commandments, they are threatened by the fact that Jones, in cooperation with Snowball, may come back to the farm at any time. Several years pass by and during this time the windmill collapses three times. The pigs put the blame on Snowball and execute some of the animals for being in cooperation with him. During this time, Napoleon turns out to be the national hero, a legend. He is called "father of all animals, Terror of Mankind". Now he is appearing only on rare occasions. As the animals sell their products to their neighboring farmers, the farm prospers. However, only the pigs and the dogs benefit. 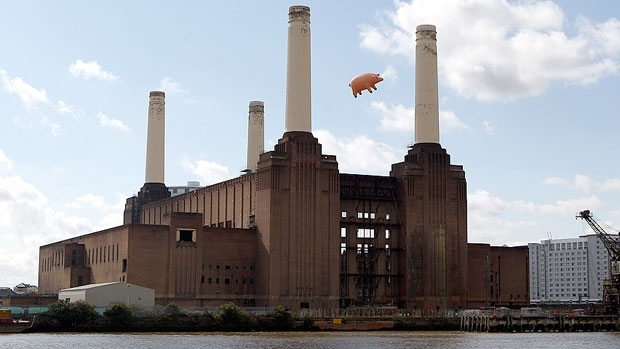 At this point, the final transformation of the pigs starts. They are now walking erect, carrying whips. By this time the Commandments have already been altered. The pigs have started to live in the farm, wearing human clothes, using a radio and a telephone. In the final scene, the pigs invite the farmers to dinner. In his brief speech Napoleon says that "their sole wish, now and in the past, was to live at peace and in normal business relations with their neighbors." He adds that the animals' foolish customs will be "suppressed" and that "the name 'Animal Farm' will be "abolished." From then on the farm will be "known as 'The Manor Farm'". The other animals watching the pigs from outside realize that they cannot distinguish the pigs from the men: "The creatures outside looked from pig to man, and from man to pig, and from pig to man again; but already it was impossible to say which was which" (p.120). The final transformation takes place and the criticism is directed towards the fact that through revolutions only the tyrants are changed. As Hollis puts it, "It was the Orwellian thesis, right or wrong, that power inevitably corrupts and that revolutions therefore inevitably fail their purpose." In order to comprehend the satire and criticism brought by the author, it is necessary to consider the form of the novel, analyzing the methods he makes use of. First thing to deal with is point of view. 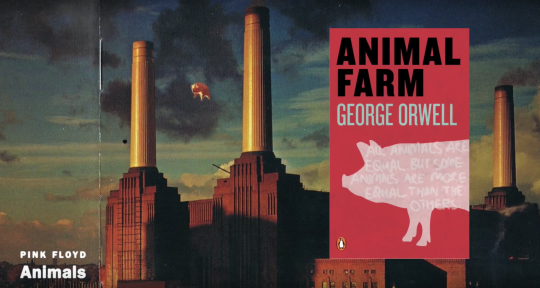 Orwell tells the story from the viewpoint of the animals so that the human beings are not characterized fully. 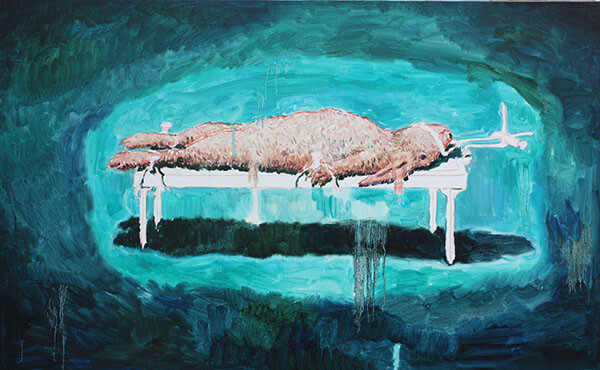 He uses a simple language to reflect the naive perception of the poor animals. Although the reader is made to observe the way the animals are deceived, s/he is never allowed to penetrate the minds of the characters. Orwell's skillful management of the point of view enables him to make the reader like the animals but at the same time realize that their ideals are doomed to failure. Hence, this viewpoint creates ironic distance because of which the reader sees and understands the plots of the pigs which the animals miss. The reader feels sympathy for the beasts subsequently. In addition, the author creates frustration and anger on he part of the readers and confusion on the part of the animals. The ironic distance, furthermore, emphasizes the corruption in human nature. Though old Major starts with good intentions, irony goes hand in hand with satire to reveal that these good intentions are certain to change into evil intentions. For in this advice lies the possibility for just the opposite of the "promised land." The second device Orwell uses is characterization. Orwell attributes human traits to the animals, still letting them appear as animals; for this reason "we almost nowhere feel that we are in an animal world." Besides, "since the whole point of animal satire is to show up humanity by revealing human traits in nonhuman characters" , the men in the novel are kept in the background. In the story, the animals display goodwill and eagerness to attain a better life promised by their leaders. Although they were hopeful in the beginning, this hope is gradually destroyed by the selfishness of the pigs. These animals display one human trait at a time. For instance, Snowball is imaginative and tries his best to establish a democratic system with committees and meetings. Napoleon on the other hand, is the absolute dictator who destroys hope for a better world and abuses their goodwill. While Boxer is the very image of a strong, determined and faithful worker, Benjamin remains as the perpetual skeptic. These descriptions prove that although they do not have fully developed characters, they are character types. They have easily recognized character traits. Since they have combined both the human and animal characteristics, they are believable. By giving these animals only one human characteristic at a time, the writer avoids complex characterization. Thus, he prefers "concentrated singleness of attack" which "might almost be laid down as a second law of the genre …. that the animals shall stay both animal and human. It removes the possibility of very complex characterization." Therefore, "the force of the tale" lies in the "singleness and simplicity on the human level"
The third method Orwell uses to direct his satiric attack on his object is irony. To begin with, just before his death, old Major warns the animals against mankind: "Man serves the interests of no creature except himself…. All men are enemies….And remember also that in fighting against Man, we must not come to resemble him…. Do not adopt his vices…. And, above all, no animal must ever tyrannize over his own kind …. All animals are equal". However, the reader observes that the pigs undergo a gradual change. They start to live in the farmhouse, adopting human vices. They start to walk with whips in their hands. Napoleon's insistence on the fact that the windmill should be built and re-built several times is suggestive of the establishment of his tyranny. His sole aim is to keep the masses busy so that he can easily rise to absolute power to terrorize his own kind. As time passes, Napoleon starts to lead a pleasant life while the working class is suffering. His ruling body turns out to exploit the animals more than Jones and the others did. In the end, irony reaches its peak. Old Major's doctrines are totally reversed. For, it is impossible now to distinguish between the pigs and the men. The animals that played the leading role during the revolution replace the human masters under whose oppression the animals suffered a great deal. This final transformation of Napoleon, who is in cooperation with the farmers, confirms what Leyburn says: "The revealing light of the allegorical satire is turned most searchingly upon the villainous hero himself: and when he is allowed to go off triumphant in the end, the feeling is that the wicked ways of the world have been convincingly displayed". Since the newcomers will definitely be corrupted by the newly gained power, the revolution fails its purpose. "Whatever goes upon two legs is an enemy. ""Whatever goes upon four legs, or has wings is a friend" changes into:"Four legs good, two legs better. ""No animal shall wear clothes. ""No animal shall sleep in a bed" changes into: "No animal shall sleep in a bed with sheets. ""No animal shall drink alcohol" changes into: "No animal drink alcohol to excess. ""No animal shall kill other animal" changes into: "No animal shall kill other animal without cause." 7. 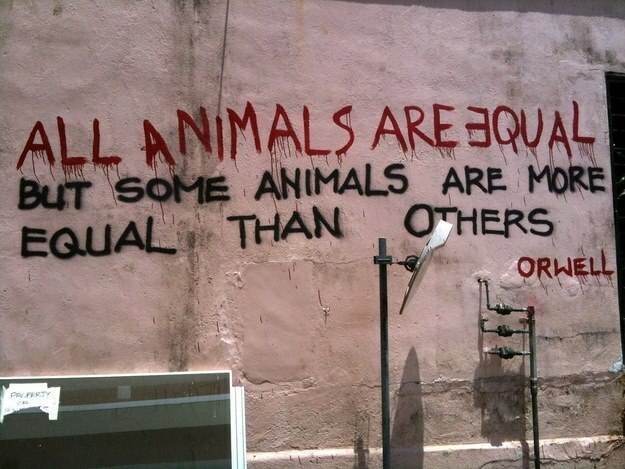 "All animals are equal"changes into: "All animals are equal but some animals are more equal than others." These Commandments have been changed in order to justify what Napoleon and the other pigs do. However, none of the animals but Benjamin discusses much about the change. For they do not clearly remember the true nature of them. They prefer to depend on what Squealer tells them and to believe in his propaganda since they are incapable of sorting the truth from the lie. They readily accept the Commandments as they are written on the wall of the barn. They never realize the fact that they are no more than slaves and they remain, as Boxer does, dedicated to their cause. But Benjamin has always been skeptical of the outcome. And he is the only one who realizes that Boxer is taken to the knacker's. In the third place, the use of the farmhouse and the destruction of the windmill have ironical effect on the level of the plot structure. The farmhouse represents the evil old Major warns the animals against. The farmhouse means luxury that men of power enjoy. When Napoleon and the pigs decide to live in luxury, this action suggests Napoleon's ambition for power leading to his cooperation with human beings. It is the very place where the total transformation from pigs to human beings takes place. On the other hand, the windmill represents the spirit of Revolution since it is associated with progress. However, the project of the windmill takes on a new dimension when Napoleon becomes the omnipotent leader. He uses it as a means through which he keeps the working animals engaged all the time. Moreover, he uses the windmill for another purpose. He blames Snowball for destroying the windmill. Therefore, he creates a scape-goat through which he is able to control the masses. The existence of the scape-goat is the reason why the animals become more determined and more faithful to their causes. Since they have experienced freedom, they do not want to work under the tyranny of Jones who is supposedly in league with Snowball. In this way, Napoleon is made the omnipotent leader who is the only one who can save the animals from human beings. It is ironical enough that the animals choose to suffer under the dictatorship of the pigs. The leader, ambitious enough to rule the animals who are deprived of democracy, isolates himself from the working class. He knows that so long as he keeps the illusion going, he will be able to maintain his individualism while reducing the others to the level of ignorant and voiceless masses who are no more than extensions of him. Since the aim of satire is to criticize the object of attack, teaching a moral indirectly with a humorous tone, in the animal satire, the author uses animals instead of human beings and places his animals in human situations. Hence Orwell is able to attack on the political ideas he is contemptuous of and entertain the reader at the same time. 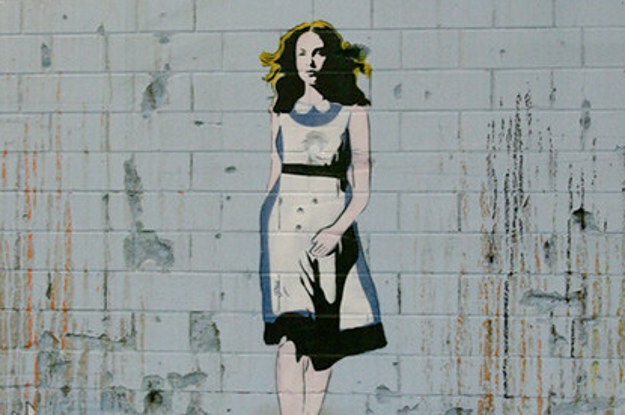 In the novel, Orwell comments on society rather than on individual human characteristics. 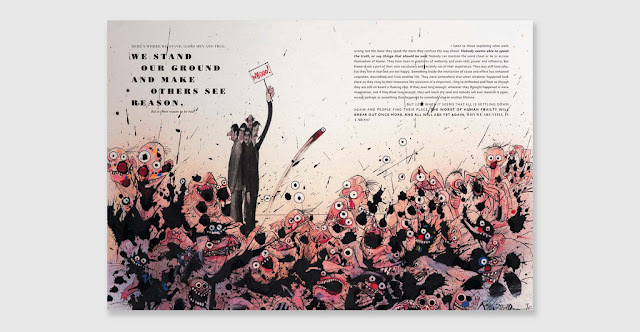 His characters are disguised as animals and the human characters are not fully developed. The animals display "a single dominant trait" at a time. Thus, he aims at a social satire "couched in animal terms as for the story whose object is simply laughter at a human foible". His skillful manipulation of point of view creates a convincing atmosphere. For "imaginative scheme of the animal allegory" reflects the illusion of those who are deceived into working for the tyrants of a totalitarian system. In the end, the reader gets a message of a lesson full of despair since Orwell aims to convey that revolutions take place in a vicious circle in the end of which new dictators betray the cause, giving rise to the same beginning. 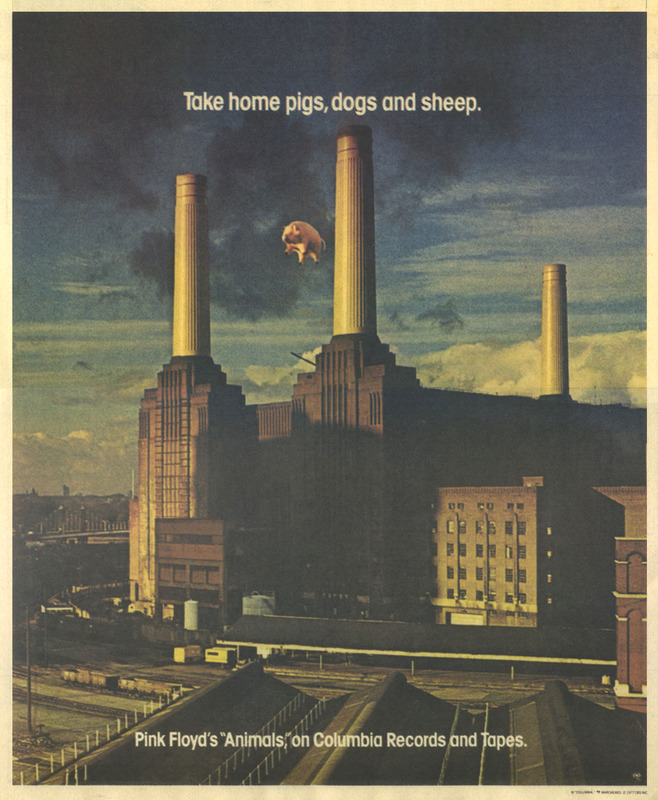 Pink Floyd - Animals. Roger Waters parody of the Twenty-third Psalm in "Sheep"
The Lord is my shepherd, I shall not wantHe makes me down to lieThrough pastures green he leadeth me the silent waters byWith bright knives he releaseth my soulHe maketh me to hang on hooks in high placesHe converteth me to lamb cutletsFor lo,m he hath great power and great hungerWhen cometh the day we lowly onesThrough quiet reflection and great dedicationMaster the art of karateLo, we shall rise upAnd then we'll make the bugger's eyes water.